Give generously to help disaster victims in the Eastern U.S.
Itâ€™s time for year-end tax planning. Live seminar by Michael Gray, CPA scheduled for December. Stock Options telephone seminar on November 30. Social security wage ceiling increased for 2013. Many retirement account thresholds increase for 2013. Gift tax annual exclusion will increase for 2013. Second Circuit says DOMA is unconstitutional. Production of foreign records required. Some California LLCs can avoid minimum tax. Remember to get consent for nonresident LLC members. Multi-state businesses should file refund claims. Guidance issued on throwback sales. 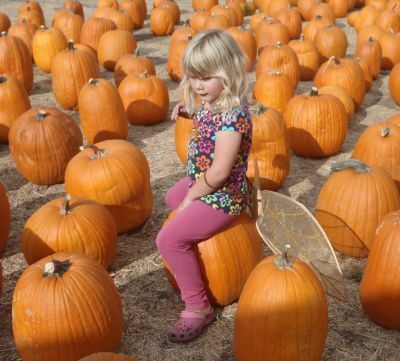 My granddaughter, Kara Siemer, in a pumpkin patch. Thanksgiving falls on Thursday, November 22 this year. We hope you will be able to celebrate Thanksgiving with family and/or friends. Thanksgiving seems to be an appropriate time for us to say, â€œThank you!â€�, especially to our clients, but also to you who read this newsletter and our many friends who refer clients to us and make our business possible. According to news broadcasts, Hurricane Sandy has inflicted devastating storm damage in the eastern U.S., particularly in Jersey Shore and New York City. Please give generously to the American Red Cross or your favorite relief organization to provide relief to victims of this disaster. As we all know, the Giants swept the 2012 World Series and are World Series champions twice in three years. This is a great achievement! Everyone in the San Francisco Bay Area is very proud of you! With the coming holidays and continuing education days, Michael Gray will have very limited availability for year-end tax planning meetings. Reserve your appointment now by calling Dawn Siemer on Monday, Wednesday or Friday at 408-918-3162. My brother, Stephen, and I are celebrating our 61st birthday this year. We are thankful for many blessings, including that our mother, Eleanor Gray, is still living and reasonably healthy. I am also thankful for my family, including Janet, my wife and partner for 41 years, our three grown children, our daughterâ€™s husbands and our four grandchildren. They are the real treasures in my life. Michael Gray will be giving a live seminar during December 2012. On December 7, he will be speaking about â€œYear End Tax Planning For Employee Stock Options.â€� The seminars will take place from noon to 1:30 p.m. at Hobeeâ€™s Restaurant in the Pruneyard, in Campbell. Lunch is included. The fee for participants is $97. Stock Options telephone seminar by Michael Gray, CPA on November 30. Michael Gray will be giving a telephone seminar, â€œYear-End Tax Planning For Employee Stock Options,â€� Friday, November 30 from 1 to 2:30 p.m. Pacific Time. The fee for participants is $97. The ceiling for social security withholding for 2013 will increase to $113,700 from $110,100 for 2012. Unless Congress takes action, the social security rate will increase from 4.2% for 2012 to 6.2% for 2013. As part of Health Care Reform, a 0.9% Medicare surtax will apply for singles with wages exceeding $200,000 and for married couples earning more than $250,000 in wages. The surtax will only apply for employees, not employers. The threshold at which the â€œnanny taxâ€� applies to household employees will remain at $1,800. The maximum 401(k) and 403(b) contributions will increase from $17,000 for 2012 to $17,500 for 2013. The maximum compensation for computing certain retirement account benefits will increase from $200,000 to $255,000 for 2013. The catch-up contribution for individuals age 50 and above for 401(k)s, 457s, 403(b)s and SEPs in unchanged at $5,500. The maximum contribution for defined contributions plans (such as profit sharing plans) is increased from $50,000 for 2012 to $51,000 for 2013. The annual benefit limit for a defined benefit plan will increase from $200,000 for 2012 to $205,000 for 2013. The maximum IRA contribution will incease from $5,000 for 2012 to $5,500 for 2013. When taxpayers participate in a retirement plan at work, the deductible IRA contribution will phase out from $59,000 to $69,000 for singles ($58,000 - $68,000 for 2012) and $95,000 to $115,000 for married persons filing joint returns ($92,000 - $112,000 for 2012). The maximum contribution to a SIMPLE plan will increase from $11,500 for 2012 to $12,000 for 2013. The AGI limit for the saverâ€™s credit for 2013 will increase from $28,750 in 2012 to $29,500 for 2013 for singles, and from $57,500 in 2012 to $59,000 for 2013 for married persons filing joint returns. The gift tax annual exclusion per donor, per donee for â€œpresent interestâ€� gifts will increase from $13,000 for 2012 to $14,000 for 2013. A female couple was married in Canada and lived in New York. One of the partners died, and the survivor claimed the federal estate tax marital deduction for inherited property. The IRS disallowed the marital deduction under the Federal Defense of Marriage Act (DOMA). The Second Circuit Court of Appeals found in favor of the survivor. The IRS has said it must continue to follow DOMA until it is repealed or the Supreme Court finds it unconstitutional. A taxpayer argued that he wasnâ€™t required to produce records relating to foreign bank accounts because a subpoena violated his Fifth amendment right against self-incrimination. The Fifth Circuit Court of Appeals found against the taxpayer, because the records fell within the Required Records Doctrine. A domestic LLC that hasnâ€™t conducted any business in California may cancel its registration within 12 months of filing its Articles of Organization by filing Form LLC-4/8, Certificate of Cancellation. If these requirements are met, the LLC isnâ€™t required to pay the first yearâ€™s annual tax. The form must be filed before the tax has been paid or itâ€™s nonrefundable. If a nonresident member of a California LLC fails to sign Form FTB 3832, LLCâ€™s List of Members and Consents, the LLC must complete Form 568, Schedule T to compute the memberâ€™s tax liability. When the nonresident member signs Form FTB 3832, he or she is agreeing to file a California income tax return to report his or her taxable income from the LLC. Distributions to nonresident members are subject to 7% California tax withholding. The tax computed on Schedule T may be reduced by any amount withheld for distributions during the taxable year. Multi-state businesses with California operations should consider filing refund claims. A California appeals court has affirmed its decision in Gillette. In that decision, the court ruled that California must accept a single weighting of the sales factor in the four-factor formula for apportioning income among the states, versus a double-weighting specified in Californiaâ€™s Revenue and Taxation Code. The single weighting is specified in the Multiple-State Tax Compact, from which California has subsequently withdrawn. Itâ€™s going to take some time for this issue to be resolved in the courts. Meanwhile, taxpayers who can benefit from single-weighting sales should file protective claims for refund. The Franchise Tax Board issued Notice 2012-01 to provide guidance to taxpayers for filing such claims. See your tax advisor for details and assistance. In some cases, sales made by California businesses to customers in states where a taxpayer doesnâ€™t file an income tax return are reallocated or â€œthrown backâ€� to California for determining income taxable by California. The FTB has issued a Chief Counsel Ruling that specifies whether or not such sales are subject to throwback in different circumstances. Itâ€™s time for sending engagement letters to your clients. Be sure you also have written consent for initiating additional services for your clients. See this web page: www.taxtrimmers.com/threat.shtml.